A friend pointed me in the direction of this Doctor Who-themed clip over the weekend, a series of short ads for New Zealand superannuation services featuring Tom Baker in full-on Fourth Doctor mode. The ads were made in 1997, long before the return of the show to BBC One in 2005, and I wonder how much they had to pay for the rights to use the character and the music. 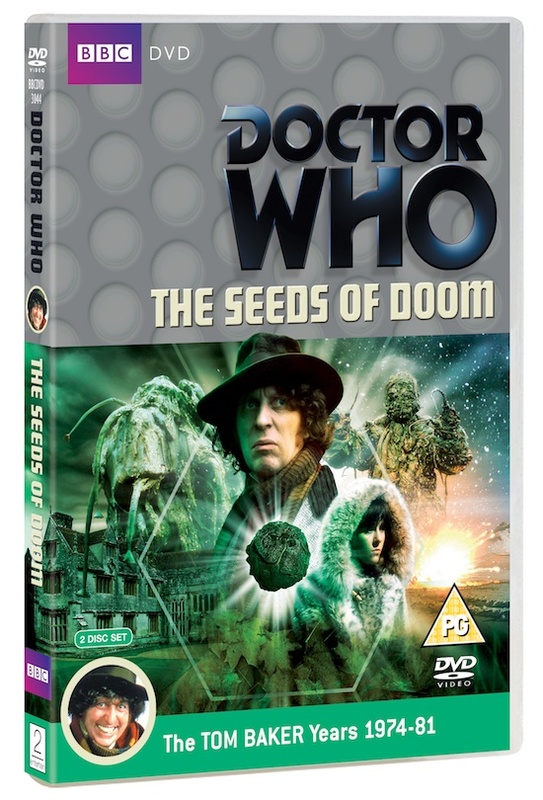 The Avengers meets Quatermass in this latest Doctor Who DVD release, a rollicking adventure which takes us from the Antarctic to the English countryside as the Doctor interrupts diabolical deeds in the greenhouse. Flown to present day (well, 1970s) Antarctica, the Doctor (Tom Baker) and Sarah (Elisabeth Sladen) discover a research team who have unearthed two strange pods. It’s not long before the scientists realise they’ve got something dangerous on their hands, something which has turned one of them into a creature capable of destroying them all. With a reclusive millionaire, Harrison Chase (Tony Beckley), determined to gain control of the pods, the Doctor must make his way back to England before the Krynoid threat escalates. Veteran writer Robert Banks Stewart’s script is one of the Tom Baker era’s finest, packed with incident and memorable dialogue. That something this entertaining was made for children is testament to the BBC’s commitment to the series at the time, one which, tragically, began to fade as the decade wore on. Only in his second season as the Time Lord, Baker is still clearly relishing the job, his banter with Sladen and assorted goons one of the story’s finest elements. Beckley makes for a suitably seedy (pun intended) bad guy, smooth yet clearly bonkers, a non-alien foe worthy of the Doctor’s scorn. John Challis, a few years before his turn as Boycie in Only Fools and Horses, is fine support, while the rest of the cast seem to relish the quality dialogue they’ve been supplied with. If one was to nitpick, then the six episode format would be the main sticking point, the need to stretch a relatively simple idea over so many weeks resulting in some rehashing of events once we move from the icy wastes to Chase’s mansion. Thankfully, the sheer energy of the production, overseen by director Douglas Camfield and his assistant, Graeme Harper, means it’s easy to overlook this, and we’re left with a quality adventure which should satisfy both the more mature fans and the younger saplings more used to nuWho. Extras-wise, there’s a wealth of new material available across these two discs. First-up is the commentary, featuring contributions from an on-form Tom Baker, happy to recall being adored by old ladies in the mid-70s, while Robert Banks Stewart, John Challis, Michael McStay and Roger Murray-Leach are just some of the others lending their voices to the track. Disc two gives us the in-depth PodShock documentary, the cast and crew looking back affectionately at the stories creation, albeit with details of various problems which beset the production. A tour of Athelhampton House today, where the story was filmed in 2010, an interview with composer Geoffrey Burgon (whose score is rewarded with its own isolated music track), and a fascinating look at what production staff job titles really meant are some of the other gems on here, while the latest Stripped for Action featurette looks at the Fourth Doctor’s time on the printed page. If that lot isn’t enough, there’s a photo gallery, Coming Soon trailer and PDFs of Camfield’s paper edit of the story for a compilation version of the story.